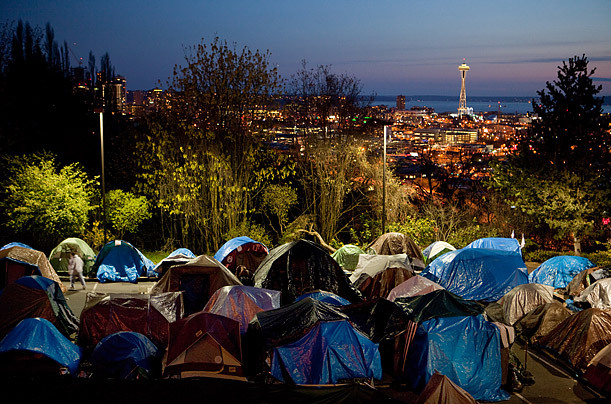 Homeless people sleep in an encampment on Capitol Hill in Seattle. "I had been wanting to take pictures of homelessness," says photographer Aaron Huey. "I see alot of it in Seattle and I'm always torn. I went to this tent city for the homeless, which is near St. Mark's Cathedral, on a quick assignment  I had only two days. But on the first day I shot very few photos. I used the time to get to know people there so they would be comfortable with me coming in with a camera. The second evening is when I made most of my pictures, including this one. I wanted a shot with the Seattle skyline in the background to give context to this homeless encampment juxtaposed against the larger, more affluent city. But I wasn't sure if I'd be able to see that from the tent city. Then I found a janitor who allowed me to go up to the top of the cathedral. I made it up to the roof, and by crawling through some windows, I was able to get that shot."